Iro Haarla (piano); Ulf Krokfors (double bass); Barry Altschul (drums). Finnish musicians Haarla and Krokfors have been musical collaborators for two decades and, in their formative years, listened to Carla Bley’s music, in particular, earlier interpretations of her compositions for the Paul Bley Trio. 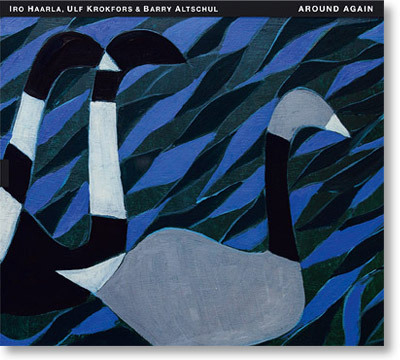 Around Again features, on drums, Altschul, who played and recorded many of the featured compositions with Paul Bley and a variety of different bass players in the 1960s. Twelve tracks of varying length: Closer; Vashkar; Batterie; Ida Lupino; Around Again; Olhos De Gato; Intermission Music; King Horn; And Now, The Queen; Utviklingssang; Start; Jesus Maria. The first has a distinctly minimalist quality, with large gaps and (to me) apparently random notes. This theme continues although the narrative does become fuller. Periods of melodic playing are interspersed with looser, more disjointed sequences. I am ashamed to admit that I am not conversant with Carla Bley’s compositions from this era, so I am unable to judge how true the representation of Bley’s originals are. On the basis of this rendition, I’m not sure I’m in too much of a hurry to find out! The skill and musicianship of the three protagonists are, I’m certain, not in question – but this is not for me. There will be a cadre of Bley enthusiasts who will be well pleased to have this in their collection. Included in the nicely presented CD folder is a detailed set of notes in the form of a booklet pasted to the inside cover. Around Again is set for international release by Tum Records (TUM CD 054) on February 15. Hi If you are not familiar with the tunes then why review the CD. Your lack of CB experience means that you are telling the listener nothing that will help them choose. It may be better next time you are in this situation to research a CB fan who could do the review for you. Point taken, Andy. However, I also think it's equally valid for a reviewer to come to the table without any preconceived notions to affect his/her judgment.